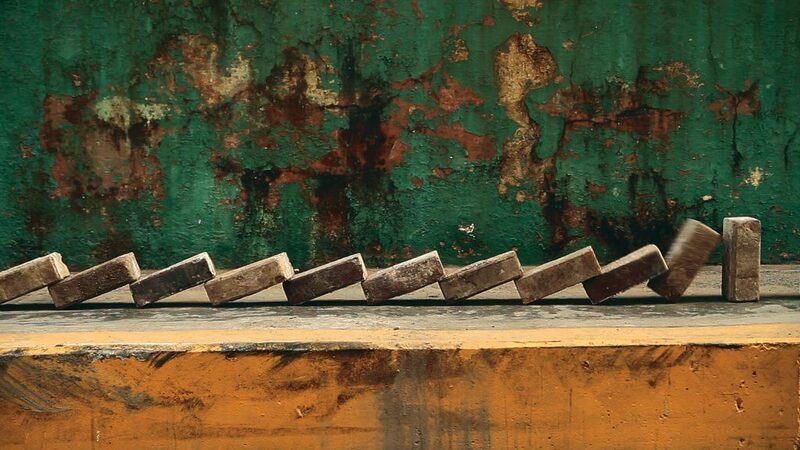 Efecto dominó (Domino effect), 2013 [still]. Courtesy of the artists. Secret Passages presents five recent video works by artists Donna Conlon and Jonathan Harker. Embodying their distinctly playful yet incisive critiques of contemporary culture, the films operate along two thematic axes: hidden narratives and the serendipitous possibilities of a journey. Tapitapultas (Capapults) (2012) and Bajo la alfombra (Under the Rug) (2015) begin with idiosyncratic scenes and materials—disposable spoons used to catapult colorful plastic bottle caps, an ever-growing assortment of trash swept under a section of turf—only to reveal sharp observations of accumulation, consumption, identity, and the stories we fabricate to conceal the consequences of our actions. Zincfonía tropical (Tropical Zincphony) (2013) and Efecto dominó (Domino effect) (2013) abandon conventional storytelling in favor of abstract and joyful romps through two distinct yet typical Panamanian landscapes. In a final odyssey, Voz a la deriva (The Voice Adrift) (2017) offers a mysterious and ultimately unresolved tale of hope, fragility, and resilience. Donna Conlon (b.1966, Atlanta) and Jonathan Harker (b.1975, Quito), who also exhibit individually, have been making work together since 2006, often using a playful approach to address serious sociopolitical themes. Specifically, they examine contradictions in the construction of Panamanian national identity, as well as issues of consumerism, climate, and political and societal disparities between Central America and the United States. Their collaborations have been exhibited at the Pérez Art Museum, Miami; South London Gallery, London; Museum of Contemporary Art, Detroit; Solomon R. Guggenheim Museum, New York, Palais de Tokyo, Paris; as well as events such as Prospect. 4: The Lotus in Spite of the Swamp, New Orleans, Pacific Standard Time: LA, Los Angeles, and the 1st Asunción Bienniale, Paraguay, among others. In 2010, Conlon and Harker received a production grant from the Harpo Foundation.